STAR CITY /Moscow Region/, October 17. /TASS/. Russia’s space corporation Roscosmos will carry out three unmanned launches by the end of the year before the next manned mission will be put in space, Roscosmos’s executive director for manned space programs, Sergei Krikalyov, told a news conference on Wednesday. "The Soyuz rocket will be launched only after the inquiry has identified the causes of the emergency and measures have been taken to prevent such situations in the future. Under the existing rules there must be at least one unmanned launch before the flight of a manned spacecraft. We have plans for at least three launches (before the next manned mission due in early December) from the Kourou space site, the launch of an unmanned spacecraft and of an unmanned spacecraft Progress. The confirmations will be more than enough to put the next crew in space," Krikalyov said. 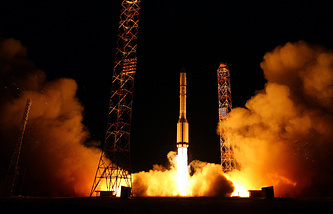 A Soyuz-FG rocket carrying the manned spacecraft Soyuz MS-10 blasted off from Baikonur on October 11. It was to deliver to the International Space Station Roscosmos’s Alexei Ovchinin and NASA’s Nick Hague. The rocket’s failure triggered an emergency rescue system, which sent the landing capsule into ballistic reentry. It was the first such emergency in 35 years. The crew landed safely in Kazakhstan’s steppe. The crew stayed in the city of Baikonur during the night under doctors’ supervision and was flown to Moscow on October 12.